What did you love best about Power Italian I Accelerated - 8 One Hour Audio Lessons - 144 Study Units? I went from being a complete novice to actually conversing in Italian with natives with this little $19.00 program. It's amazing effective if you use it every day. I loved the fresh and intense approach which forced me to recall and really learn how to speak Italian. I have read reviews that state the contrary, but I have listened and relistened to this program and the material is always new, fresh, and then it is all strategically reviewed so you get strong at speaking, responding, creating original sentences. The teaching approach and technique used in Power Italian is the best I have yet experienced. No guessing. Everything is explained clearly in English by the American instructor and then spoken slowly then quickly by the native Italian speaker. Then the best part. You get repeated chances to get the questions right, to remember correctly. You literally fail your way to fluency with this program just like a little child is allowed to stumble, fall, get up and try to walk until he or she finally makes it. Have you listened to any of Mark Frobose’s other performances before? How does this one compare? Yes. I have tried a number of Mark's programs and they are all fantastic. I just have to repeat that it's an unbelievable value to get this kind of effective instruction for so little money, and then have so much fun learning it. The best part is showing off in front of your friends. I had an extremely happy response to Power Italian Accelerated. The first time you listen you learn enough to say "Where is the bathroom" and "I would like to order now please". Don't waste your money on all of the bizarre language programs out there. 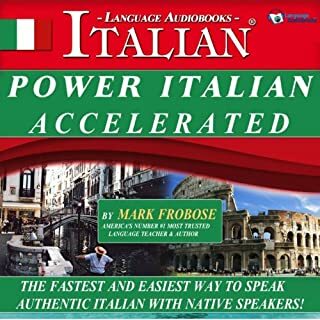 Language Audiobooks really makes great programs and I highly recommend you try Power Italian. You'll be speaking Italian fast and enjoying that process they use! If you could sum up Power Spanish Conversation Intensive in three words, what would they be? 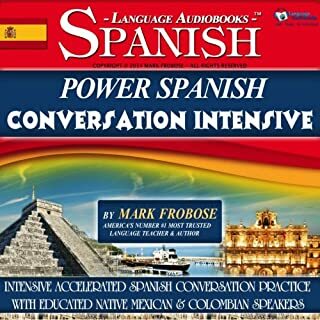 This program really allows you to master the basics of conversational Spanish with effective review. The only way to really learn to speak a language is by intelligently practicing it with a great method. This program has the best method I have ever used, and I am really learning to speak Spanish thanks to it. What was one of the most memorable moments of Power Spanish Conversation Intensive? When I learned how to ask "Can you tell me what time the plane arrives from ......"
I use that one every time I travel to Latin America. Also .... "Don't mention it" - No hay de que. And "It's going to arrive really late, right?" Very useful for Latin America, believe me. I love the caring way Mark goes the extra mile to explain and review everything. I am still deeply moved by the fact that I learned so much Spanish. Buy it and use it. It really works. Don't be afraid to review. As Mark says ... Repetition is the mother of fluency. 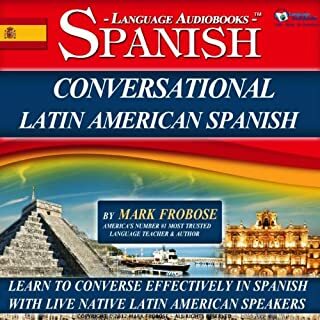 I would highly recommend this program to anyone who wants to learn to speak real conversational Spanish. What I mean by "real" is the way Spanish speaking Latin Americans really talk. So many programs I have tried just don't give you this kind of true life practice. With Conversational Latin American Spanish, they have several native speakers, all with different accents, and they let you join in with them, repeat, practice. review ..... I really learned fast from this approach and never got bored once. What I like best is the way the program starts out slow, lets you listen to the Spanish, gives you the meanings in English, lets you listen and repeat slowly in Spanish, and then hits you with it faster and faster until you're at native speed. Then they are kind enough to ask "Did you get that?". Most of the time I did not get it. Then they give it to you slowly one more time. Then fast again. This is a great way to learn to speak any language. My favorite scene is where I learn to say "I am from the United States" and then I learn to tell people I am American. I am from the United States, and then I learn to add to all of it to sound natural and really communicate in Spanish. Understand conversational Spanish for the first time in your life, and then actually learn to speak it too. First slowly, then medium, then at native speed. And remember it too. You get lots of chances to make mistakes and get it right. You practice over and over, but it never gets boring. Compare this method, which allows you to repeat at different speeds, with a memory technique that lets you bring it all back from memory. 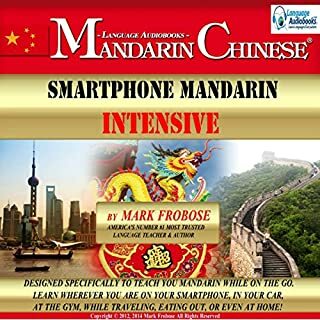 Smartphone Mandarin Intensive is the most effective and versatile basic Mandarin Chinese audio program in the industry. It can be used anywhere for any duration of time to teach to you speak authentic Mandarin Chinese while in your car, at home, or on your smartphone! Designed specifically for use while on the go, this challenging, versatile and fast-paced program introduces the basic sentence structures necessary for effective communication. It then reviews and challenges you to interact successfully with a trained and educated Mandarin Chinese speaker. I would definitely recommend this book to anyone wanting and extremely fast and simple way to learn to speak a complicated language like Mandarin. This system is so refreshing after having tried Pimsleur, Rosetta Stone, and other more expensive options. I am amazed they can offer such a great program for such a low price. Basically, Smartphone Mandarin is totally portable. The author explains all the details and the native Mandarin speaker (a woman) teaches the tones, the accent, all while showing you how to create original senteneces. I have two favorite characters in this audiobook language program. One is the female native speaker from Beijing and the other is the narrator who explains everything to you in plain English. "I want to sleep" "I have to pay" etc .... and then they teach you how to say "now" and "later"
"I want to pay now" "I have to pay later" and so forth. Keep in mind that I learned all of this while I jog in the morning, shop in the evening, and during my commutes to work. How to learn to really speak Mandarin in detail with one great easy program that you take everywhere with you and learn with in little segments wherever you are. Buy it and compare what you get out of this with and what they teach you, and the time they take to break all of it down for you to explain which word goes where, and then to review it all for practice. Compare that with the other Mandarin programs out there and see how amazingly superior this is to other programs.